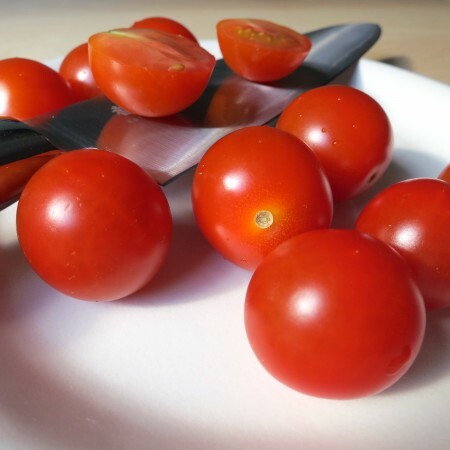 Find the right plate or lid that, once placed on the cherry tomatoes with a light pressure, will allow the knife to slice them right in the middle. Gather all the cherry tomatoes on your cutting board. Place a lid or a plate over them. Holding the plate, slice the cherry tomatoes all at once using a really sharp knife. You’ll get perfectly sliced cherry tomatoes. To obtain additional support you can use two plates. When you put them together, make sure there’s a small gap in between to allow space for the knife blade. Be careful not to cut your fingers!